"The author's attention to detail and skilled storytelling give readers the feeling that they are viewing the series of events close up, in real-time; an exceptionally well-told story of a man who was consumed with power and a young woman who was driven to a desperate and unbelievable crime of passion. Highly recommended!" The Columbia Review. 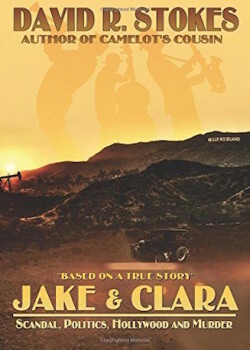 “Jake & Clara: Scandal, Politics, Hollywood, and Murder” by David R. Stokes is an exciting new book that will be greatly welcomed by lovers of history and narrative nonfiction. Jake was also a multi-million-dollar contributor to Warren Harding, who won the White House in 1920. Harding, in turn, planned to make Jake the most powerful businessman in America. But Mrs. Harding insisted that Jake (a married man) end his decade-long affair with his mistress, Clara, who was twenty-years his junior. Driven by his dreams of ambition, Jake obeyed Mrs. Harding’s demand and dumped Clara a couple of weeks after Harding was elected. And soon after this rejection took place, Clara shot Jake. By the time he died, Clara had escaped and was on the run. A headline-grabbing national search was conducted for the fugitive. “Clara sightings” were reported far and wide. Finally, a pair of colorful lawmen found Clara in an unlikely hiding place and brought her back to Ardmore, Oklahoma to face the charge of first-degree murder. Clara’s trial was one of the most sensational murder trials of the era, orchestrated by a team of powerful lawyers. The final twist came when Hollywood decided to put Clara’s story on the big screen…starring Clara as herself. Author David R. Stokes, a Wall Street Journal bestselling author, brilliantly retells this story of scandal with the careful, researched expertise of a historian. His attention to detail and skilled storytelling give readers the feeling that they are viewing the series of events close up, in real-time. Readers will cherish “Jake & Clara” as an exceptionally well-told story of a man who was consumed with power and a young woman who was driven to a desperate and unbelievable crime of passion. Highly recommended!